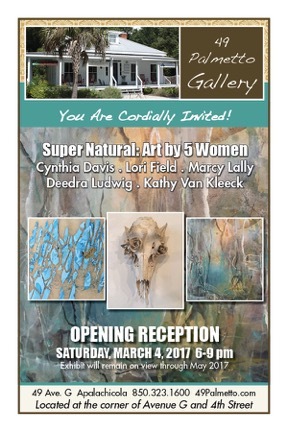 49 Palmetto Gallery in Apalachicola is hosting an opening on Saturday, March 4th, 6-9pm, of Super Natural: Art by 5 Women. The show features the work of Cynthia Davis, Lori Field, Marcy Lally, Deedra Ludwig and Kathy Van Kleek. The exhibit will remain on view through May 2017. For more information on this and other offerings by 49 Palmetto Gallery, please visit their website.